Yale electric forklifts are one of the most ergonomically advanced and productive forklifts available in the market today. These products provide outstanding battery shift life, very low energy consumption, increased productivity and acceleration due to the ECO- eLow mode. 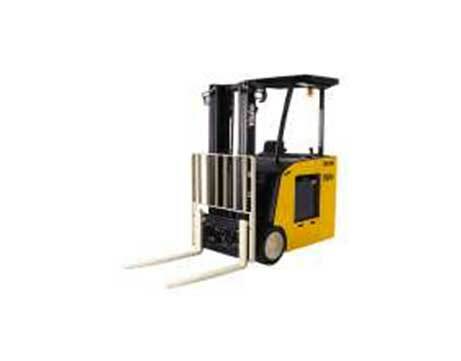 The three wheeled forklifts are available in different configurations and lifting capacities. In short, the electric forklift is designed to increase productivity, increased ergonomics and low cost of ownership for widest range of applications. The three wheeled electric forklifts offer class-leading manoeuvrability among three–wheel trucks over the full range of 1500kg to 2000kg. The electric forklifts gave one of the shortest operating aisle width which when combined with a battery with highest capacity, gives increased productivity. The operator can also avail the choice of energy low (eLow) or High performance (HiP) settings. Yale Electric trucks have been designed to offer outstanding versatility and to surpass the demands of the most challenging working environments. Yale has designed the electric trucks to provide industry leading ergonomics, increased battery shift life and productivity and truck uptime. With lowest energy consumption in the market and low maintenance costs, the Yale electric range provides the perfect answer to driving down the cost of ownership. The electric forklifts have highest quality design with components used for reliability and durability. The transmission is sealed for life, with increased uptime, no risk of contamination and reliable operations over time. CANbus technology provides high speed communication and significantly reduced wiring complexity. This ensures world class dependability. These electric trucks have been designed to comfortably accommodate the smallest to tallest operators allowing them to make adjustments as per the height and weight, providing correct suspension. Each forklift has reduced whole body vibrations along with standard armrests and easy forward and reverse tilt adjustments for ideal seating positions. Each electric truck has manual levers that have been designed with soft mouldings and a contour shape which works with the way the hand falls naturally. For increased comfort, one can also go with the option of high backrest which offers lumbar support. Each of these electric trucks has been designed with intelligent onboard diagnostics and CANbus technology which significantly reduces the need for repeat servicing. The hydraulic tank, filter, pump motor and controller are all in one place and are easily accessed by removing the rear cover. Yale products also offer longer service intervals which brings down the cost of servicing the truck.